Simonis cloth enhances your enjoyment of your game by allowing you to play your best. Simonis cloth looks, feels and wears differently than any other billiard cloth. Why Simonis cloth? Simonis is the truest playing cloth. This means that it will provide the best play possible on any table. The balls do not touch the slate or the rubber, they only touch the cloth, therefore the cloth is one of the most functional aspects of the table and of the game. 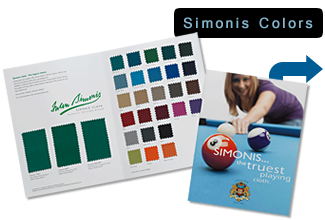 Simonis offered the first worsted cloth for billiards. Why worsted cloth? Worsted construction means that there are no short fibers that can release from the cloth to form "pills" or fuzz-balls that have to be removed from the playfield in order to allow the ball to roll straight. Woolen vs. Worsted = no comparison. Simonis cloth practices green manufacturing and is considered a low environmental-impact company! Click here for more information.